As of now, ICJS has entered 2.97 crore FIRs nationwide, involving over 10.88 crore individuals. ICJS is an OTP-enabled web platform that integrates police, prison, and court records for government and police use. At a recent meeting at the Home Ministry among representatives of the ministry, National Informatics Centre (NIC), National Crimes Record Bureau and National Mission for Safety of Women, the NIC agreed to input further data into the Integrated Criminal Justice System (ICJS) that it maintains. ICJS is an OTP-enabled web platform that integrates police, prison, and court records for government and police use. As of now, ICJS has entered 2.97 crore FIRs nationwide, involving over 10.88 crore individuals. 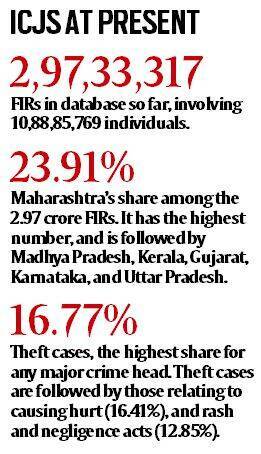 Maharashtra accounts for nearly a fourth of all these FIRs. The highest number of cases under major heads involve theft, causing hurt (both about one-sixth of all cases), and rash and negligence acts. The ICJS covers suspect profiles combining data from prisons, FIR data from Crime and Criminal Tracking Network and Systems, and courts. In its present form, it enters details such as a photo, state, religion, gender, nationality, age, type of case, marital status, whether or not the suspect is a drug addict, and biometric data. At an NIC programme on September 28, a presentation outlined the expansion plans — ICJS now proposes to include social media profiles, and details of immigration, prosecution, fingerprints and National Investigative Agency records, allowing a “360 profile view”. It proposes to introduce a “risk score” for the profiles. The Home Ministry, state governments, district authorities and police stations will be able to view the statistics relevant to their geographies. The deadline for the update is October 31. 3 Explained: How many Rohingya are in India, what is their status?